For Buddhists, India is a land of many Buddhas. From time immemorial, Bodhisattvas have been born within India’s borders, have awakened there, and have attained final Nirvāṇa. But they cannot easily accept most details included in his biographies. Available sources are 2-fold - textual and archaeological - and neither is satisfactory. Textual sources cannot be fully trusted, since even the earliest extant texts date to 5 centuries after Śākyamuni’s death; archaeological sources are older, but sparser in their details. One chronology places his life circa 566-486 B.C.E. ; a 2nd, circa 488-368 B.C.E., and other dates are proposed as well. Scholars do not know all the doctrines Śākyamuni taught, nor how people regarded him in his own day. Lacking even such basic knowledge, one can consider the social milieu of Buddhism’s origins in only the most general terms. These texts represent the Indo-Aryans as proud warriors, noble masters of the world who by 1000 B.C.E. began replacing their caravans with agrarian settlements. As agricultural production increased, villages developed into towns, and towns into cities. Vedic Brahmin priests performed rituals, told stories of the gods, and explained the working of the universe; they even guaranteed supporters a favourable place in the afterlife. Although the Brahmins held that their sacred knowledge was valid in this new urban context, some found that a hollow claim. Men like Siddhārtha Gautama were not satisfied by the ordinary patterns of daily life, or the Vedic legitimations thereof. Such men left their families and wandered out of the cities to become Śramaṇas (seekers). Siddhārtha was to become the most successful critic of the Vedic Brahmins, and the most famous representative of India’s seeker movement. Those Brahmins claimed to be the offspring of Brahmā (the creator god), and thus to be conduits of super-mundane power (Brahman) in the human world. They come across as greedy, foolish, proud men who hide their fraud behind high-flown claims to supremacy based upon the ancient names of their clans and caste. whose institutional genius lay in his ability to legitimate new rituals of social engagement appropriate to the economic situation of his day through claims that he was merely reforming a broken social-spiritual order. This verse promises that Buddhist “Brahmins,” unlike the Vedic, are not frauds, for their Brahmin-hood is guaranteed by the imprimatur of Śākyamuni himself, the teacher of true Dharma. The multiple connotations of the word Ārya - the ethnonym for India’s conquerors, the adjective Noble, a description of Buddhist truths - connect Śākyamuni’s religious innovations with hallowed memories of the past. This was presented as a truly efficacious way to earn spiritual merit, ensuring a family member’s favourable afterlife. As receivers of gifts, Buddhist monks were ideally suited to the new urban landscape of northern India. According to Buddhist lore, the Saṅgha was founded when Śākyamuni taught the Dharma-cakra-pravartana-sūtra (Turning the Wheel of the Law) to 5 men who had been his companions when he undertook intense ascetic rigors before he attained Buddhahood. As the Saṅgha’s reputation spread, it earned support from wealthy merchants and kings. Such patronage was necessary, for this community was comprised of Bhikṣus (beggars living on alms). For as a social institution, Buddhism was woven into a web of parallel institutions - economic, political, familial, medical, cultural - that had no necessary stake in the Saṅgha’s perpetuation. Potential donors had definite expectations about how Bhikṣus should comport themselves. If monks transgressed those expectations, they stood to lose support. It did not strive to undermine fundamental social canons. Indeed its rules often legitimated and conserved those canons. Śākyamuni prophesied that if he founded an order of nuns the Saṅgha would remain true to his teachings for 500 years only, whereas if he did not admit women, his male brotherhood would survive 1 000 years without decay. Ultimately Śākyamuni relented, after pledging Mahāprajāpatī and all future nuns to accept 8 extraordinary rules, which thoroughly subordinated the female Bhikṣuṇīs to the male Bhikṣus. In sum, the male institution’s reluctance to grant unreserved legitimacy to its female counterpart reflected a broader cultural ambivalence in India concerning women, one that was misogynist in its value judgments, even while it recognized the inevitability of women’s social presence. Without a single, universally accepted voice of authority, Buddhist monks became increasingly divided over wisdom, practice, conduct, and religious goals. - on the other hand, the continuing need to conform to changing social, cultural, political, and economic structures. The first example of such a battle comes from the stories of Śākyamuni’s own life, when his cousin, Devadatta, attempted to supplant him as the Saṅgha’s leader. The sources suggest that this rebellion was swiftly quashed by Śāriputra and Mahā Maudgalyāyana, Śākyamuni’s chief disciples. Buddhist traditions claim that this council was comprised of 500 monks, all Arhats. It was presided over by Mahākāśyapa, an early convert and the most accomplished monk still alive. The purpose of this council was to recollect all Śākyamuni’s teachings, and thus to establish the discourses (sūtra), monastic rules (Vinaya), and formal doctrines (Abhidharma) that would sustain the unified Saṅgha in Śākyamuni’s absence. all of his pronouncements were recited, confirmed as the legitimate Buddha-vācana (Word of the Buddha) by a congregation of perfect men, and set in their appropriate canonical baskets. they still could not reckon how many subgroups existed within the Saṅgha that followed a Dharma and Vinaya owing nothing to Rājagriha’s convocation. The meeting held in Rājagriha is remembered as only the first of several. As time progressed, the ideally Unified Saṅgha splintered into numerous disparate sects (Nikāya), each claiming to faithfully preserve Śākyamuni’s Dharma and Vinaya. It is difficult to give a precise account of these later councils, for each sect relates this history from its own biased point of view. With the exception of Theravada materials, all other sources agree that the dispute was resolved and that the “lax practices” of the Vaiśālī monks were declared unacceptable, a verdict apparently accepted by the Vaiśālī monks themselves. Thus, for the time being, the unity of the Saṅgha was restored. a division between one group that styled itself the Sthāvira-vāda (Pāli, Theravāda; The Teaching of the Elders) and a second group that called itself the Mahāsaṁghika School (The Great Assembly, or “Majority”). Accounts vary as to the cause of the dispute; according to some, the disagreement was occasioned by the so-called 5 points of a certain Mahādeva, which concerned the fallibility of the Arhat. It now seems more plausible, however, that these points arose later and occasioned a schism within the Mahāsaṁghika subgroup itself. More likely is that the original dispute was provoked by the addition of some new Vinaya rules by the group that styled themselves the “Elders,” which were rejected by the more conservative Mahāsaṁghikas. All the schools that subsequently emerged within Indian Buddhism are offspring of one of these 2 main groups. all contributed to the further division of the Saṅgha into numerous Nikāyas, as the Sthāvira-vāda and Mahāsaṁghika sects both ruptured internally. Some of these Nikāyas were distinguished by little more than geography, others by unique doctrines, and still others in terms of their ritual practice. Each Nikāya possessed its own canon, grounding its own profession of orthodoxy. Unfortunately, with the exception of the Theravāda’s canon in Pāli, and scattered fragments from other Nikāyas, little of this once vast literary corpus survives. Monastic competition after Śākyamuni’s death was not the only agent of institutional change. The people of Kuśinagara claimed these relics (śarīra) for themselves, since Śākyamuni had chosen their territory for his final Nirvāṇa. But the people of other territories swiftly demanded relics as well. To stave off war, equal shares of Śākyamuni’s remains were given to all. Each of these measures was then housed in a memorial Stūpa. Stūpas associated with Śākyamuni provided sacred sites at which lay and monastic Buddhists alike were able to enter his otherwise inaccessible presence. Once in that presence, they could make offerings and reap merit. Thus, Stūpas promised spiritual power to the kings who controlled them, and particularly prestigious sites would also have generated great revenues from pilgrims who travelled from far and near for worship. Similarly, Caityas (shrines commemorating places visited, and objects used, by Śākyamuni) also became pilgrimage centres. Such shared ritual, in turn, became the foundation of a shared religious identity, an all-inclusive community called “the 4-fold assembly” in Buddhist texts. But even though patterns of worship gave the laity a bona fide position within this assembly, the institutionalization of pilgrimage also granted additional duties and opportunities to the monks. Large monastic communities grew up around major Stūpas; these monasteries’ inhabitants served as caretakers, priests, and teachers. Acting for the good of the Buddha, of their brotherhood, and of their kingdom, monks made Buddhism a fixture of the Indian religious landscape for nearly 2 millennia. Artefacts dating to the reign of Aśoka, ruler of the Mauryan dynasty (3rd century B.C.E. 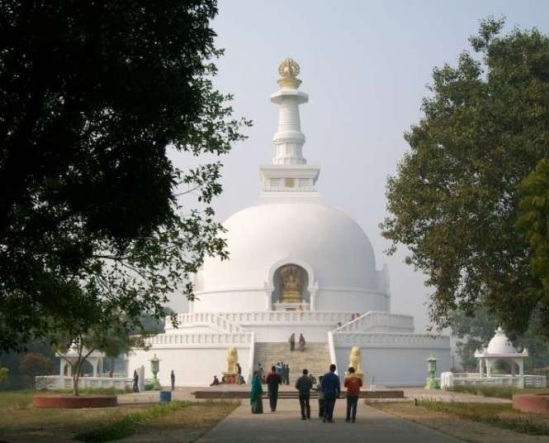 ), provide the oldest extant evidence for Buddhism in India. Aśoka was an important early patron of the Saṅgha, and his exertions on its behalf are celebrated in traditional Buddhist writings from Śrī Lanka to China. Legend holds that Aśoka raided the original group of Stūpas in order to redistribute Śākyamuni’s relics into 84 000 Stūpas, making that presence available throughout his kingdom. Aśoka is said to have held a Grand Council in order to re-establish a single orthodoxy within the Saṅgha; he also supposedly made pilgrimage to all the places important to Śākyamuni’s life. The Bhābrā edict, for instance, recommends a set of 7 texts for Buddhist monks and laity to read and study (all the texts focus on ethics, suggesting that, for Aśoka, good Buddhists were also good citizens). The Kauśāmbi edict denounces disunity within the Saṅgha, ordering schismatic monks to return to lay status. The Nigliva inscription tells that Aśoka doubled the size of a Stūpas dedicated to a past Buddha named Konākamana. devoted Buddhists made pilgrimages, and nostalgic tales of Śākyamuni’s harmonious Saṅgha contrasted with the sharp-edged glare of contemporary circumstances. The Mauryan Empire did not long survive Aśoka. It was followed by 5 centuries of political turmoil, during which indigenous dynasties and foreign invaders vied for supremacy. Although Buddhism established a base identity during Mauryan times, the succeeding era of political competition and social diversification fostered new doctrinal and institutional expressions. During these centuries, monastic spats increased the number of Nikāyas to 18, or more. Additionally, monasteries and pilgrimage centres were increasingly founded outside the Gangetic basin: in the South (Amarāvatī, Nāgārjunīkoņḍa), central India (Bhārhut, Sāñcī), and the Northwest (Takṣaśīla, Haḍḍa, Bāmiyān). A tradition of representing the Buddha in iconic form developed during this period as well, alongside numerous regional styles. The Mauryan dynasty was succeeded in north India by the Śuṅga, whose first ruler, Puṣyamitra Śuṅga (185-149 B.C.E. ), showed a strong interest in Vedic ritual, and governed with the support of Vedic Brahmins. Buddhists number Puṣyamitra among the Saṅgha’s greatest enemies. In central India during this same century, a Greek legate erected a pillar in Kṛṣṇa’s honour. One of the Indo-Greek kings, Menander (ca. 150 B.C.E. ), is claimed as a Buddhist convert, while the Kushan royal Kaniṣka (1-2nd century C.E.) sought to emulate Aśoka through his generosity and close stewardship of the Saṅgha. The fact that so many Nikāyas came into being so quickly testifies to the ideological ferment of this time. Each Nikāya claimed orthodoxy, inspiring some partisans to adopt stalwart sectarian identities. Zealous to recover that origin, they accused those monks of being hypocritical, hedonistic, lazy, and unstudied in the rules of conduct. These reformers singled themselves out by advocating living in forests, an optional practice for all monks. But even more importantly, these monks sought to reform Buddhism by declaring themselves to be Bodhisattvas, riding the Bodhisattva-vehicle (Bodhisattva-yāna) to perfect Buddhahood. Rather, these Bodhisattvas were united by a common vision, for which Nikāya membership was beside the point. They held that Bodhisattva-hood, and ultimately Buddhahood, was the only legitimate aspiration for Śākyamuni’s followers. For the renunciants, monastic vows and Bodhisattva’s vows were not in conflict. To the contrary, by aspiring to become Śākyamuni’s equal, a monk demonstrated just how seriously he took his renouncer’s role. For the laity, too, to articulate a Bodhisattva’s vows was to signal one’s serious religious intent. Most Nikāyas held that only monks can become Arhats; individuals who aspired thus were expected to abandon lay life. But the nature of the Bodhisattva path made it such that a Bodhisattva could marry, work, raise a family, and still be spiritually adept. Thus the same vow that enabled Bodhisattva monks to aggrandize themselves as Śākyamuni’s legitimate heirs, allowed Bodhisattva laity to aggrandize almsgiving and worship as significant accomplishments on the path to Buddhahood. However, there is one aspect of religious life that these scattered Bodhisattvas did share in common: a desire to learn more about how they should live, practice, and think as Bodhisattvas. The Nikāyas had little to say about the Bodhisattva figure, and what information their canons did provide was general and retrospective. In the centuries after Śākyamuni’s Nirvāṇa, members of the Nikāyas composed (or edited) Sūtras, but they presented their work as the Buddha Śākyamuni’s. By the 1st century B.C.E., a new genre of Buddhist literature was being written, focusing upon the path and practices of Bodhisattvas. The earliest texts that do still exist, from circa 1st century C.E., reveal this Bodhisattva movement to have been diffuse and numerically insignificant. But they also begin to use a distinctive name, Mahāyāna (Great Vehicle). The Mahāyāna began as a minor reform movement within the constraints of Nikāya-Buddhism. It soon developed new and distinct forms of the religion. These Sūtras show that Mahāyānists were concerned with reforming Buddhism on a number of fronts: doctrinal, sociological, soteriological, cultic, and mythological. Some severely criticize Buddhists who do not take the Bodhisattva vow, while others contain no such polemic; some speak to a monastic milieu, while others champion lay Bodhisattvas. This early Mahāyāna was heterogeneous, with Bodhisattvas even disputing other Bodhisattvas in an open-ended process of decentralized change. That is to say, archaeological data do not suggest that the Mahāyāna directly affected monastic life, patronage, ritual, or even education during the 1st, 2nd, or 3rd centuries C.E. Only in the 5th century is there significant public evidence of Mahāyāna Buddhism in India. The “underground” nature of Mahāyāna at its inception is one factor in this slow transition from spiritual movement to public institution. But an important catalyst toward change came in 320 C.E., when Chandragupta I founded a dynasty that united North India as a single state for the first time since Aśoka. Nikāya-Buddhism was well suited to such a system because the Nikāyas emphasized the worth of the monks (or the Stūpas they controlled) as recipients of donation. Indeed, Buddhism gained such prominence in the centuries after Śākyamuni’s death in large part because its ideology justified the accumulation of money, and provided a way to benefit from that accumulation even after death. Beginning with the Gupta dynasty, however, this money-economy began to give way to one based upon ownership of land. Rather, as “Lords of the Earth,” the Guptas permitted petty kings to retain residual control over their regions, and gave fields and villages to Brahmins, who then administered those lands. one did not have prestige because one could enter into many exchange relationships, but due to one’s close alliance with the imperial suzerain. For Buddhism this meant that the wealth, position, and surplus resources of the merchants who had made up the bulk of the religion’s early lay followers were diminished, leaving only members of the royalty and Buddhists themselves as donors. This required Buddhists to adjust the tenor and focus of their religious productions, and directly address royal concerns in Buddhist media. Thus, the Prajñā-Pāramitā Literature (Perfection of Wisdom texts) describes Bodhisattvas as fearless heroes, wearing armour while mounted on the Great Vehicle. Buddhas, similarly, are presented by the Mahāyāna as lords, each of his own personal Buddha-land, surrounded by divine retinues; they engage in demonstrations of mutual admiration and support; they send Bodhisattva emissaries to one another. In the 5th century, these literary tropes begin to make their mark on public art and inscriptions, revealing the symbolic manoeuvres by means of which Mahāyāna Buddhism became prominent in India. In the early 5th century, one king built a monastery at a lucky spot in this town. Over the next century, subsequent Gupta rulers added to that establishment. Eventually, devout rulers from other parts of India, and even other countries, made their own donations of buildings and resources. By Xuanzang’s day, Nālanda had become the preeminent Buddhist University. Its endowment included several hundred villages; its dormitories housed several thousand students. And although a liberal education was possible - including the Vedas, medicine, and art - every student was required to study Mahāyāna literature as well. In later centuries, Nālanda was supplemented, and then surpassed, by 2 other Mahāyāna universities, Otantapūri and Vikramaśīla; both were established by the Pāla dynasty that ruled in India’s Northeast from about 750 to 1150 C.E. Furnished with ample lands by their Pāla patrons, these great monasteries were eventually depopulated, their books destroyed, during the 13th century Muslim conquest of North India. A census of monks, made by Xuanzang in the 7th century, reveals that monks who were primarily identified with the Nikāyas still outnumbered Mahāyānists. Yet, of the original 18 + Nikāyas, only 4 remained vital, and almost half of all Nikāya-Buddhists belonged to the Saṁmatīya sect, whose tenets were the object of considerable intra-Buddhist polemic. The same economic developments that supported the Mahāyāna also instigated an efflorescence of sectarian Hinduism devoted to Viṣṇu and Śiva. Though Buddhist texts take the existence of “caste” for granted, they attempt neither to justify this social system, nor to disseminate it. From the point of view of India’s rulers, Buddhist monks were less effective ideologues than Brahmins. In turn, as Brahmins held primary responsibility for transforming villagers and tribals into royal subjects, those peoples came to identify themselves with the Brahmins’ own gods. Thus, although Buddhism flourished in the post-Gupta period, the religion became increasingly rarefied and disengaged from the immediate interests of the common masses. This transformation of Buddhism’s social base was, ultimately, the cause of its downfall in India. Buddhist monks became increasingly professionalized: intellectuals in “ivory towers,” uninvolved in the day-to-day lives of common folk. Lacking strong royal support, and long since having lost that of the populace, India’s Buddhist monks had nowhere to turn. A travelogue written by Dharmasvāmin, a monk from Tibet, reveals that by the mid-13th century there were almost no self-professed Buddhists remaining in India. These regional and national Buddhisms all looked back to Śākyamuni for authority, though the incredible diversity of their forms and expressions might have astounded him. Despite Buddhism’s demise in its first home, its traditions continued to thrive. The first concerted attempt toward reintroducing Buddhism to the land of its origin was made in 1891, when Anagārika Dharmapāla (1864-1933), the son of a wealthy furniture dealer in Śrī Lanka, visited Bodh Gayā, the site of Śākyamuni’s awakening. Distressed by the sorry neglect of this site, he founded the Mahā Bodhi Society with the aim of fostering its restoration. Educated in the Christian missionary schools of colonial Śrī Lanka, Dharmapāla imagined that a renewed Bodh Gayā would serve as a centre for the propagation of Śākyamuni’s teachings. The fact that this small town is now filled with monasteries and hostels serving pilgrims from all over the world is the realization of Dharmapāla’s dream. As a leader of India’s Untouchables, Ambedkar renounced Hinduism in favour of Buddhism, believing that this conversion would lead to greater respect for his downtrodden people. Ambedkar himself has now become a central figure of reverence for India’s neo-Buddhist movement. establishing monastic centres that serve their own people as well as the curious who visit India to learn about Buddhism. Indeed, as Buddhism became a religion with a global reach during the latter half of the 20th century, all evidence has shown a burgeoning appreciation within India itself for its Buddhist heritage.